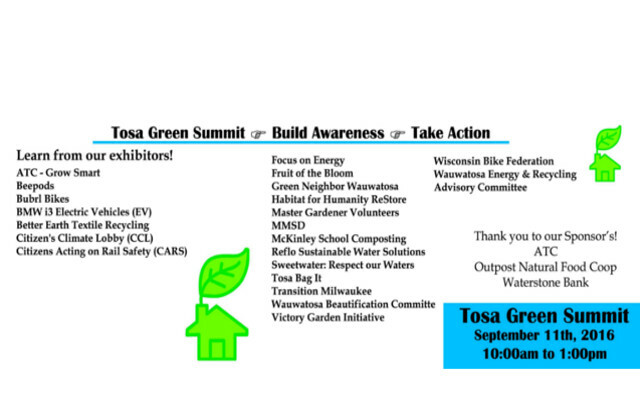 The sixth annual Tosa Green Summit will be held Saturday September 10th, 2016, from 10:00 am to 1:00 pm at the Wauwatosa Civic Center, 7725 W. North Avenue. The event is a free informational open house to learn how you can make your community green and sustainable. Over 25 Exhibitors will provide awareness and education on topics ranging from home energy, conservation, water, gardening, transportation, and food. We will also feature the documentary Bag It, which discusses the effects of plastic bags on us and on our environment. MMSD will be collecting Hazardous waste the same day from 9:00 to 2:00 pm.